Thefts include: Antoine Blanchard, Parisian Street Scene; Milton Avery, March on the Rocks, 1950; Pieter Post, A Cavalry Skirmish a Capriccio of Roman Ruins; Robert S. Duncanson, Highland Scenery: The Pass of Leny; Diego Rivera, Farm Buildings and Fields, 1928; Paul Klee, Child and Dog, 1929. A special section listing major items stolen from the Iraq Museum in April 2003, including: Head of a Sumerian Woman (Warka/Uruk, c. 3000 B.C. ), Poseidon (discovered at Hatra), Seated Female Deity (found at Temple VII), Goddess of Victory (from Hatra, c.200 A.D.), Assyrian Bronze Model Chariot, Cylinder Seal (c.2000 B.C.). A summary by a specialist in international law of the sets of treaties that form the framework for protecting cultural heritage in time of war and its aftermath—The Hague Conventions and the Geneva Convention. An account of the war damage to the important Iraqi archaeological site, Nimrud, where many precious jewels and vessels have been found in the past and where major archaeological sites and palaces are still located. Thousands of cuneiform tablets were looted from the Iraq Museum, holder of one of the major collections of cuneiform inscriptions. This article by an archaeological specialist in cuneiform writing gives a brief explanation of cuneiform tablets and an overview of the loss. A first-hand account by another noted Mesopotamian archaeologist of the UNESCO mission to Iraq organized in the immediate aftermath of the Iraq Museum looting in an effort to assess the damage. 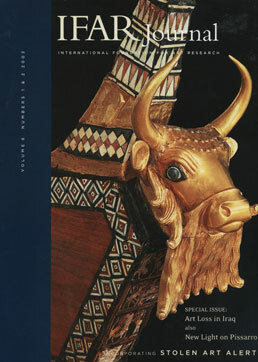 This article, by a noted Mesopotamian archaeologist, gives an overview of the looting of the Iraq National Museum in Baghdad and other sites that occurred on April 10-12, 2003. Author discusses some prime artifacts that were safely stored prior to the looting but also many great works that were lost. Also discusses important archaeological sites in the area that are being destroyed. Eulogy for a member of IFAR’s Art Advisory Council and former Chief Curator of Paintings and Sculpture, Museum of Modern Art. Following are edited transcripts of two talks and the Q&A from an IFAR Evening on the Pissarro catalogue raisonné. The speakers were Pissarro’s great grandson and the great great granddaughter of Pissarro’s dealer. From IFAR Publications: 30 years Ago, 20 Years Ago, 10 years Ago and 5 Years Ago. UNESCO has drafted a “Declaration Concerning the International Destruction of the Cultural Heritage” in response to the 2001 destruction by the Taliban of the two giant 1,500-year-old Buddhas carved into the cliffs of Bamiyan, Afghanistan. The Republic of Austria has filed a petition asking the Supreme Court to hear its case after a three-judge panel of the Ninth Circuit Court of Appeals in California ruled that Maria Altmann could sue Austria in California court regarding six Gustav Klimt paintings. News and Updates: Who Owns the Works Nationalized by Lenin? Andre Marc Delocque-Fourcaud has filed a lawsuit against the Los Angeles County Museum of Art. His grandfather, Sergei Shchukin was the owner of a great collection of modern French art appropriated by Lenin in 1918. Twenty-five of the paintings on temporary exhibit at LACMA once belonged to Shchukin. Two Assistant Deputy Wardens and two Corrections Officers have been charged in the theft of Dali’s Christ on the Cross, which was taken from Riker’s Island Men’s Correctional Facility. New York Federal appeals court affirms the District Court’s conviction of Frederick Schultz for conspiring to receive and traffic in stolen Egyptian antiquities. Schultz sentenced to prison and a fine. Brief description of the recent losses of art due to the military situation in Iraq (the looting of the Iraq National Museum, and the burning of the National Library), as an introduction to the section of the Journal devoted to Art Loss in Iraq. The following five articles address the crisis of art lost or endangered in Iraq as a result of recent military action. The article recounts the relationship between Camille Pissarro and his dealer, Paul Durand-Ruel, and discusses the exhibits Durand-Ruel arranged to showcase Pissarro’s paintings.